Digital Dubuque's media work showcases people, places and events in the Tri-States. Want to see your event or location online, send us an invitation today! Capturing life a split second at a time. Digital Dubuque's home base is on the rolling hills of Iowa near the Mississippi river in the heart of the midwest silicon prairie. We have been delivering award winning Photo, Video and Web services for over 20 years. Questions or comments please call 563-583-7128, or use our contact form. 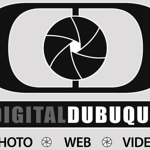 If you are looking for Digital Dubuque videos please visit DubuqueVideo.com. Search all galleries on the site.